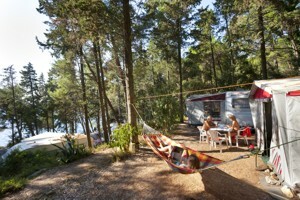 Camp Bijar is located near the ‘’museum town’’ of Osor, in a centuries-old pine forest on the island of Cres. The camp is situated in this Adriatic island’s natural lanscapes and is an ideal destination for families that have a caravan or a tent, but also for those that do not. We have one for you! Just make a camping reservation! Camp Bijar provides a range of caravan rentals in cooperation with its long-term partner Gebetsroither, making caravan rentals an affordable option. 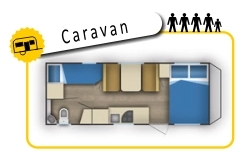 The caravans are equipped with basic equipment and are spacious enough to accommodate 4 people. All you have to do is come and settle in – Camp Bijar is expecting you! The caravans are located near the the campsite's sanitary facilities in the second row above the sea. Each caravan is equipped with 4 beds, a kitchen with a gas cooker, cooking equipment and cutlery 5 people and a refrigerator in the ante-tent. Distance from the sanitary facilities – 30 m.